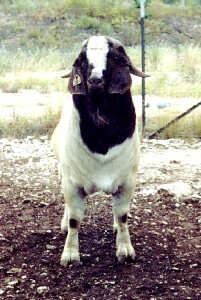 Buckaroo is a buck we acquired from Clifford George after the 2005 ASU Meat Goat Performance Test. He placed 7th in weight gain and 2nd to one of our bucks in ribeye area. Like our other sires, he was selected because of his excellent conformation. He stands square on his front and rear legs, is very long, and has a perfect bite. The underside of his tail is jet black, and his horns are set wide apart. He also passes these traits to his offspring. Buckaroo has an impressive pedigree that includes ennobled animals HMR Sumo, Mojo Magic, and IAG Nico Botha. At 9 months old we let this buck breed a number of very high quality does with great results, and performance tested the resulting bucks. 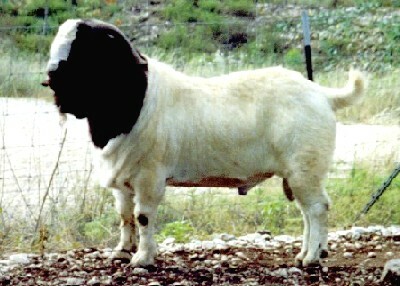 He was the second place sire at the 2006 ASU Meat Goat Performance Test behind Tarzan. His sons average daily gain was 0.640 lbs/day compared to the average of 0.566 lbs/day.